Laelia uses her power chair for the first time in our house! 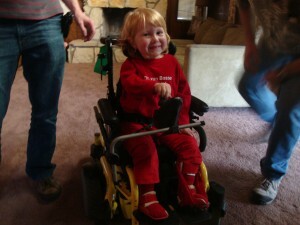 Laelia is thrilled with her new (*cough* five months old) power chair! Grandma and Grandpa had been holding onto it for us and they brought it down for us on May 13th. Laelia was excited that whole day and talked about it nonstop like it was Christmas Eve. I can’t wait to figure out how to transport this thing! As soon as it can go with her in the car then we can go more places! Like the zoo or the grocery store or the park or Disneyland! But right now we’re happy just watching her go up and down her ramp. She’s pretty happy and cute. Oh and there’s a turtle setting for slow and a bunny setting for fast. Guess who loves bunnies! Here’s a video of the first time we ever put her in her chair in the house. Enjoy! So to help the cause Laelia wants to make a very special video for a very special person! Simply go here and donate to Joel’s account. For every $5 you donate I will enter your name into the drawing. (But you have to comment on this blog and tell me how many chances you earned! 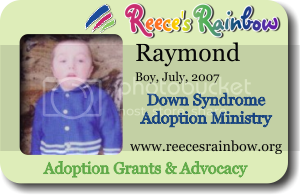 Reece’s Rainbow doesn’t just let me know who donates. :)) Once Joel makes it to $640 (which would be double the $320 he has now) then the contest will be over and we will pick the winner! (Well technically random.org will pick the winner.) Then Laelia will make a very special video for the winner. It’s that easy! All donations are tax deductible. Thanks for playing! 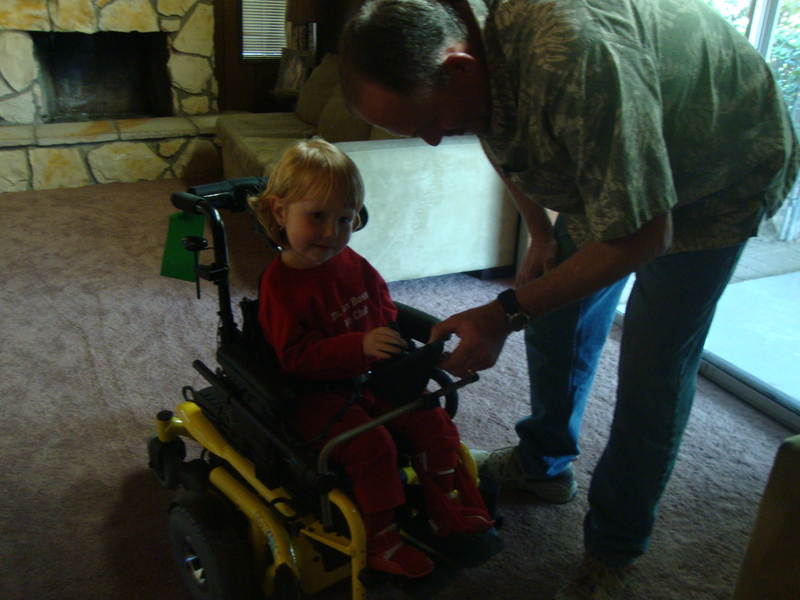 And thanks for saving a child with arthrogryposis from a life without hope! 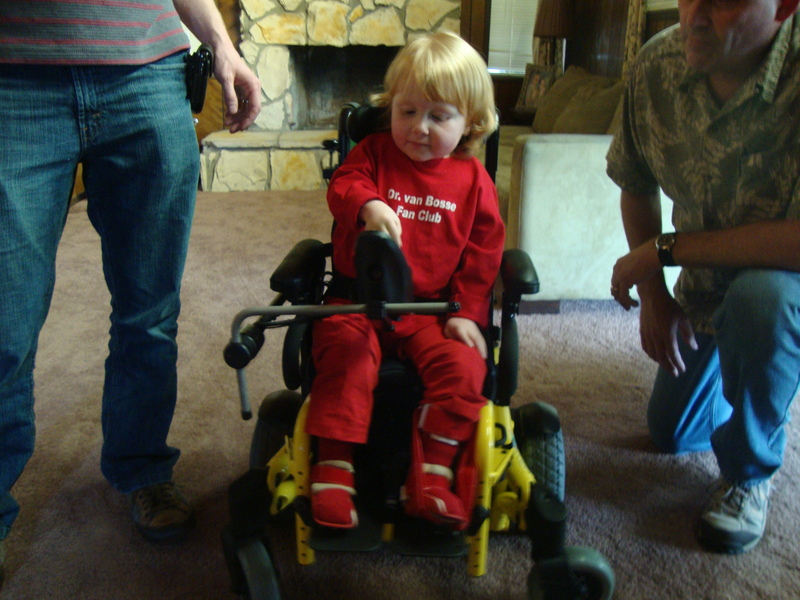 This is baby “Joel.” He has arthrogryposis like some of the best people on this planet do. Below are copied and pasted articles and stories of the reality for those with arthrogryposis in certain parts of the world. Donating a few dollars to Joel’s account by clicking on his picture will help save him from this fate by off-setting the cost of his adoption. He could be Laelia. He is so similar to her it’s scary. He haunts me. Please help me support him. Around age four, children with special needs (despite maybe having no mental problems) face mental institutions. Little has changed since that video above was made by the Today show. And I just imagine Laelia here and it makes me hurt deep within. I’m thrilled to report that we are going to the AMC conference in July! Thanks to our friends and family, both my and Laelia’s airline tickets are paid in full! THANK YOU SO MUCH!!! I can’t wait! There are so many people in our AMC family who I want to meet in person! And I want Laelia to see her friends and their abilities! It helps her so much! Thanks Sohpie and Ryan (well, really your mommies) for sending your videos to Laelia! You guys are a big encouragement to her. She does try to do the things you show her and she is getting stronger all the time! And thanks Miss Resa for the DVD of you doing everyday things. Laelia is now trying to get on the couch by arching her back too. She’s still little so it will take some time, but she tries hard! She would also like to know why you get to use the stove when she can’t. I don’t think she sees many adults with AMC so she assumes you must be big for three! I can’t wait to meet more grown-ups with AMC!!! AMC Conference in Kansas City, here we come! Can’t wait for July! So much has happened in the last few days! For one thing our summer plans are now officially crazytown. :) We decided, after a ton of encouragement, to attend the AMC Conference July 6th-10th! (This comes after announcing that we wouldn’t be going. What can we say, we thought it was a crazy plan. Mostly because IT IS. But we’re in!) Then ten days after Mommy and Little Girl get back from the conference, a parent swap takes place, and then Daddy and Little Girl are off to Shriners in Philadelphia! (For a check up, x-rays, AFO adjustments and to schedule Laelia’s pin removal surgery for later in the year.) And while they’re in Philly, Mommy (who will have just become an aunt) will be traveling to Northern California to see her family, including her sister and new baby nephew who is due at the end of June! This July is going to be BUSY! At least we hope so. If it all works out. I hope I hope! Those involved with getting our family to and from medical treatment always humble me. The Ronald McDonald House in Camden, New Jersey, has us on a waiting list already. Also it looks like we will have flights through Frontier again. (They have given us our last few complimentary flights, and were willing to help again even though their program has changed!) It goes without saying that without these wonderful programs we would be forced to, I don’t know, move to Philadelphia? Hitchhike and live off the streets? Go without care for our child? Get second-rate surgeries from unqualified doctors? Be in an insane amount of debt? Probably. I am beyond grateful. But back before anything with our Philly trip was worked out, and while I was standing in my kitchen just staring at my appointment letter from Shriners and worrying about the future (as I always do with medical trips), I can guarentee you that the LAST thing I thought would work out would be TWO arthrogryposis-related trips in twenty days! But then our wonderful friend, Kiersten, asked me to reconsider going to the AMC Conference, and offered to let us share (aka bum) her hotel room and rental car! (Despite the fact that last time she shared her hotel room with us, during the Arthrogryposis Clinic in Seattle, Laelia kept everyone up all night! I definitely won’t remind Kiersten of that. ;)) It was such a gracious offer that it sent Charley and I back to serious talks concerning the conference, and finally to a decision to go. And after that decision leaked on Facebook (that was all me :)), we were blessed by so many people writing us and telling us how excited they are that we’re coming! I love the people in our lives! Oh and the conference is not just a meet-and-greet, but a life-changing experience. There are break out sessions that cover everything from home modification to hippotherapy. (I’m hoping to get at least ten new ideas for physical therapy alone!) There are speakers who have already sent me their books or blogs, and other coordinators or board members of AMCSI who have already encouraged us so much that I can’t wait to meet them in person! Plus of course our doctor from Philadephia and other wonderful medical professionals will be there donating their time! So much all in one place! AMC families are an isolated group. 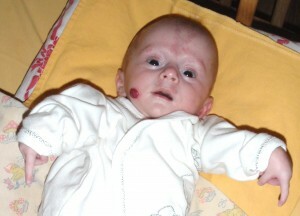 Arthrogryposis is such a rare thing that we are scattered all over the place. All previous AMC conferences have been in Florida, Pennselvania, Ohio, Texas and Chicago, so it doesn’t look likely that one will magically pop up in San Diego any time soon. And I’ve wanted to go to one of these amazing conferences from the time Laelia was born, but we just couldn’t work it out. So I’m super excited! It will be such a relief to meet a group of people who have been there. Who get it. They get the joint contractures and splints and frustrations. They cheer when their kid wipes her nose on the towels, trips his sister in the hall or steals candy off the table. Why? Because it took specialized motor function that doctors told them they may never have to accomplished those bratty behaviors! I want to be in the company of parents who get the fact that “normal” is flying for surgeries and running over the cat’s tail with a power wheelchair and fighting your school to get them to treat your kid just like the other kids. I can’t wait to be normal with these folks. And I can’t wait for Laelia to meet so many people–kids and adults–just like her! So thanks for supporting us with your encouragement! I really appreciate it! I feel completely overwhelmed by so much love!